One of the oddest myths about the Middle Ages is that people did not drink water. 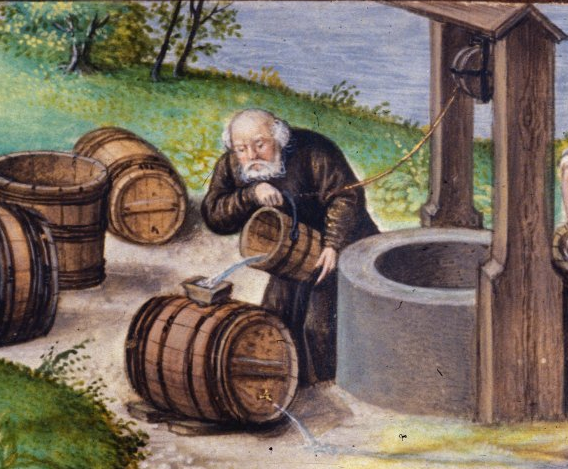 Many books and articles have repeated the notion that water was so polluted during this period that medieval men and women would only drink wine, ale or some other kind of beverage. However, there is plenty of evidence that people regularly drank water. If one did a quick glance through medieval letters and chronicles, one would find few references to people drinking water. Instead, they would speak of drinking ale or wine. This is not surprising – water is relatively tasteless – and few people would have preferred it compared to the alternatives. Like today, one doubts that too many writers from the Middle Ages would have praised their hosts for providing a cup of water instead of wine. Cities would spend large amounts of money on creating and maintaining water supply sources. For example, in the thirteenth-century the city of London constructed ‘The Conduit’. Using a system of lead pipes, it brought fresh water from a spring outside the city walls into the middle of London, where people could freely access it. City records occasionally note expenses related to maintaining and cleaning The Conduit, and during the fourteenth and fifteenth centuries this system was expanded to other parts of the city. Other medieval towns had similar systems to bring in water. If thou hast sworn by God’s hair or by His head or made use of any other blasphemous expression against God, if thou hast done so but once unwittingly, thou shalt do penance for seven days on bread and water. If after having been upbraided for it thou hast done it a second or a third time, thou shalt do penance for fifteen days on bread and water. While in this case drinking water is made to be a punishment, this does not mean that the church was trying to kill sinners. More likely, they figured that a drab diet for a week or so would be sufficient encouragement not to get involved in minor transgressions. People in the Middle Ages were also well aware that not all water was safe to drink – in addition to polluted water, which would be largely confined to urban areas, it was common knowledge to avoid obtaining water from marshy areas or places of standing water. However, if they knew the water was coming from a good source, they would not be afraid to drink from it. Like us, they just did not boast about it.